Many students in Westwood’s Senior class applied for early admission and received acceptances as early as January. In addition to receiving early admission acceptances, these students also qualified for merit based scholarships to multiple institutions and have been selected to enter the Honors programs at the colleges they will be attending. This class has also received multiple scholarship awards, including the Georgia Tech Gold Scholarship, the UGA Baldwin Scholarship and the Jesse Mercer Scholarship. Because of their impressive grades and high test scores, a majority of the graduating class will be awarded HOPE and Zell Miller, as well. Extensive preparation and SAT and ACT scores have helped boost the college opportunities for the Class of 2017. Westwood has an active SAT preparation plan which serves to assist students in reaching their full potential, and therefore broadens their options to further their education. College admission is becoming extremely competitive, and the staff at Westwood strives to work with each student to help them meet their individual goals. 100% of Westwood students are required to take the SAT, and the Westwood Senior Class of 2017 averaged a score of 1131 out of a possible maximum score of 1600. The top 10 students in the class scored in the range of 1210-1520 on the SAT, and Westwood’s Star Student, Elizabeth Glass, scored 1520 on the SAT and also earned the STAR Student award for Mitchell County. 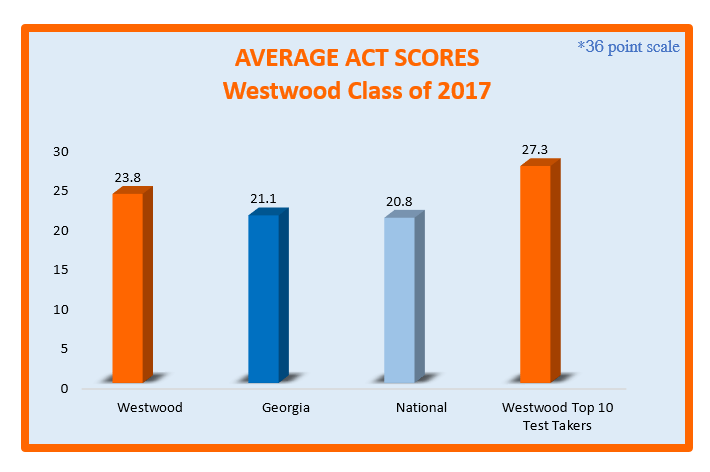 Westwood students are also encouraged to take the ACT, and the Senior Class of 2017 averaged a score of 23.8 compared to a 21.1 average score for Georgia students and an average score of 20.8 for students across the nation. The top 10 students in the class averaged a score of 27.3 on the ACT, and with a perfect score being a 36, the Westwood averages indicate a high level of preparedness in our students. According to a recent U.S. News & World Report article, “When it comes to applying to the nation’s top colleges, the competition is fierce. And as the number of applications they receive each year rises, experts say getting admitted is only becoming tougher.” At Westwood, college prep is what we do. As early as K3, the Westwood faculty is working to prepare students for college. Dedicated teachers, hard work from students, parent participation and a lot of school spirit along the way ensures that Westwood graduates are ready to enter the college of their choice. The future is bright for the students who will be graduating from Westwood Schools this Spring. The parents, administration, faculty, Board of Directors and community supporters look forward to seeing all that the members of this group will soon accomplish. Well done Class of 2017! It’s great to be a Wildcat!